2016 © Fred Sherman. All rights reserved. 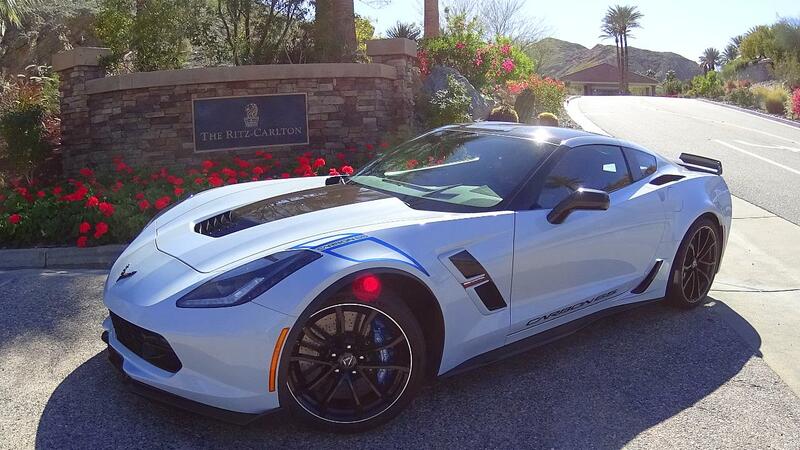 To celebrate the 65th anniversary of Corvette, Chevrolet released a special Carbon 65 edition for 2018. Only 650 cars were made (and all have been sold), about half were Grand Sport Corvettes, the other half were supercharged Z06s. I had a chance to spend a few weeks with Carbon 65 Corvette #193/650 and it was truly an amazing experience. With a seven-speed manual gearbox, it required both hands and both feet and driving was a very physical experience. I loved being totally immersed without wanting to use the stereo or touch my phone. Although protected by traction control, the strong engine and summer-only racing slick-like tires require constant attention to prevent crashing. 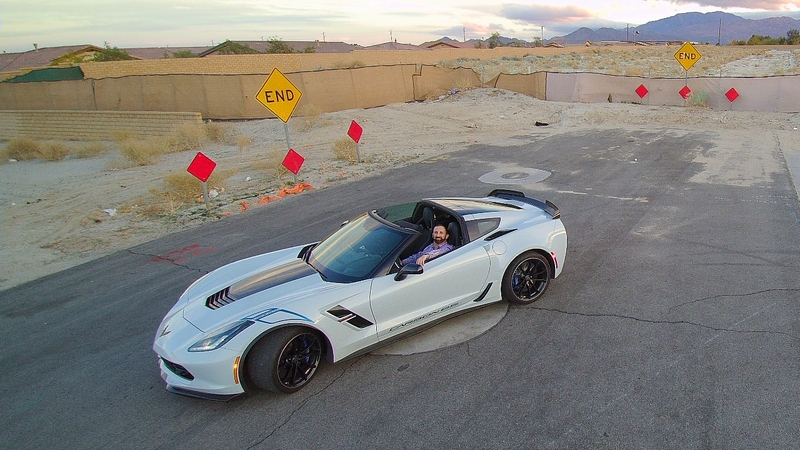 The Corvette is controlled with multiple drive modes (Eco, Weather, Tour, Sport and Track) which really do help customize the ride for the road conditions. I drove 100 miles in the pouring rain on the freeway in the Weather mode without issues. Outside, you get special Carbon 65 graphics (the cars only come in Ceramic Matrix Gray Metallic) and carbon fiber front and rear spoilers, carbon fiber side effects and quarter panel air intakes. The removable roof is carbon fiber as well. 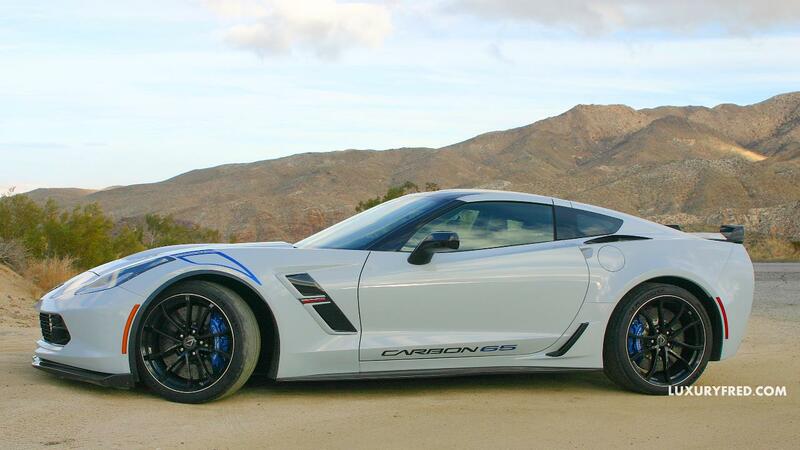 With the required Z07 Ultimate Performance package you get Brembo ceramic brakes with blue brake calipers. Inside it’s a sea of leather with blue stitching. There’s also carbon fiber trim on the dashboard, center console and door panels. It’s very luxurious inside and the build quality is that of a Ferrari or Aston Martin. 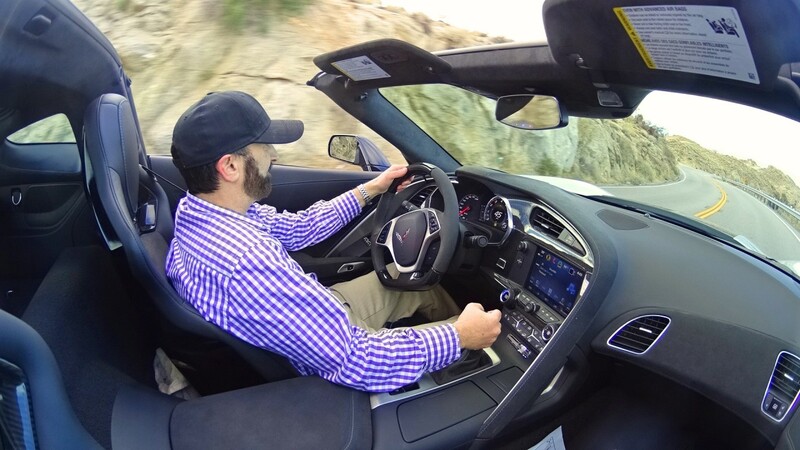 I drove the Corvette all over Southern California and put a few thousand miles on it to really thoroughly test it out. I drove out to Palm Springs on a luxury roadtrip for a visit to The Ritz-Carlton, Rancho Mirage, one of my favorite desert resorts. 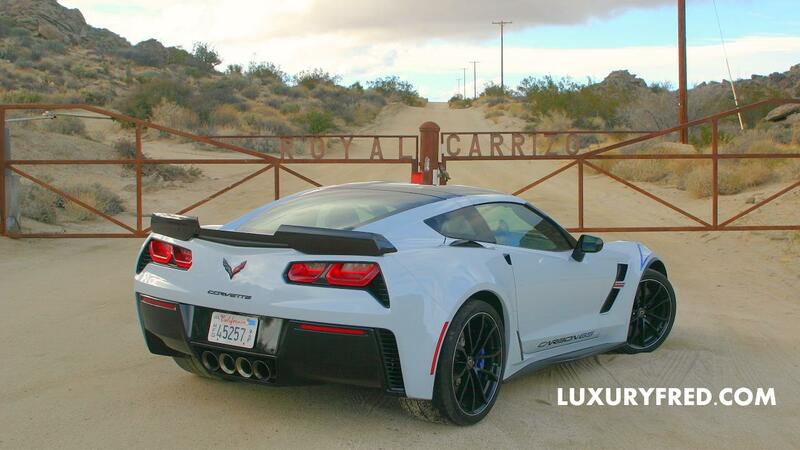 The Corvette was perfect as it has a very luxurious inside, filled with carbon fiber trim and elements. I loved the flat-bottom, F1-inspired steering wheel, done in suede and carbon fiber. Although it can be a wild beast, with the car in Tour mode, it’s quite docile and comfortable on the freeway. The V8 has cylinder de-activation so when you drive in Eco mode you can see 25 mpg with careful driving. The Grand Sport Carbon 65 has 460 hp coming from its normally-aspirated 6.2L V8 engine. 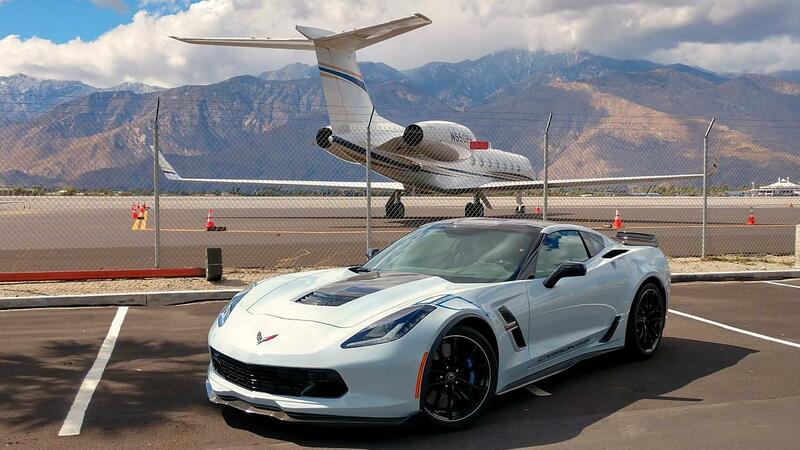 I would suggest going for the Z06 supercharged Carbon 65 with an additional 200 horsepower. It puts the car in serious supercar territory for under $120K. The 2018 Chevrolet Corvette Grand Sport Carbon 65 was $99,230. as tested. 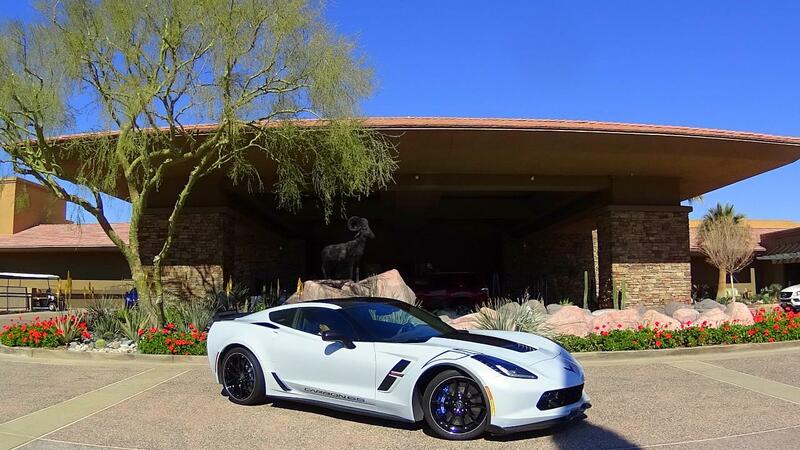 The Grand Sport Corvette is $65,495, the required 3LT Preferred Equipment Group package is $9,745, the Carbon 65 package is $15,000, and the Z07 Ultimate Performance Package is $7,995. This gets you a car loaded with every possible option and luxury amenity.